My obsession with figs is a relatively new thing. I probably had never eaten a fresh fig until my friend gave me some from the tree that was growing at a house she was renting. I sliced them, put them on my greek yogurt and drizzled them with honey. I was hooked. It was then that I decided, that I too must have a fig tree. 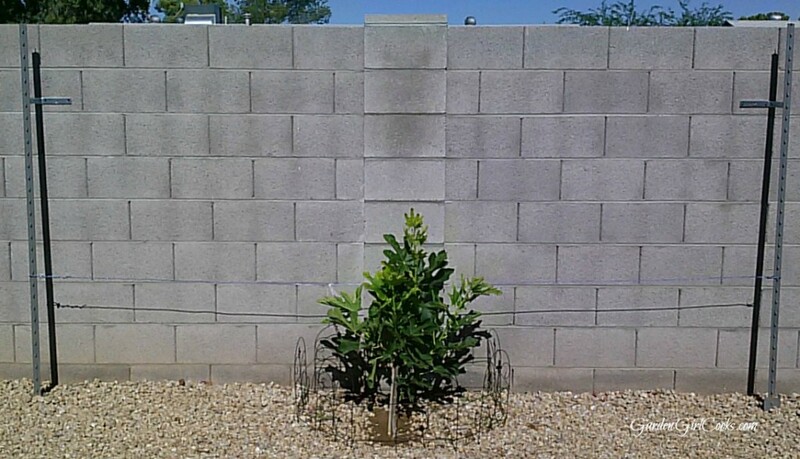 After taking the Arcadia Edible Garden Tour last year and seeing an espaliered fig tree, I knew I must build an espalier for my fig tree. 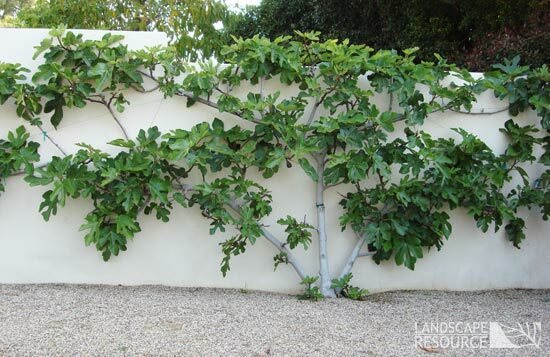 This would help keep the fig tree manageable and make reaching the figs relatively easy. Anyway, on to the Caramelized Fig Ice Cream with mascarpone and candied pecans. Another friend of mine has a giant fig tree at her condo (I know, I pick good friends, right?). She had tons, literally tons of figs, so she gave me half a ton. Okay, maybe I exaggerate a little. 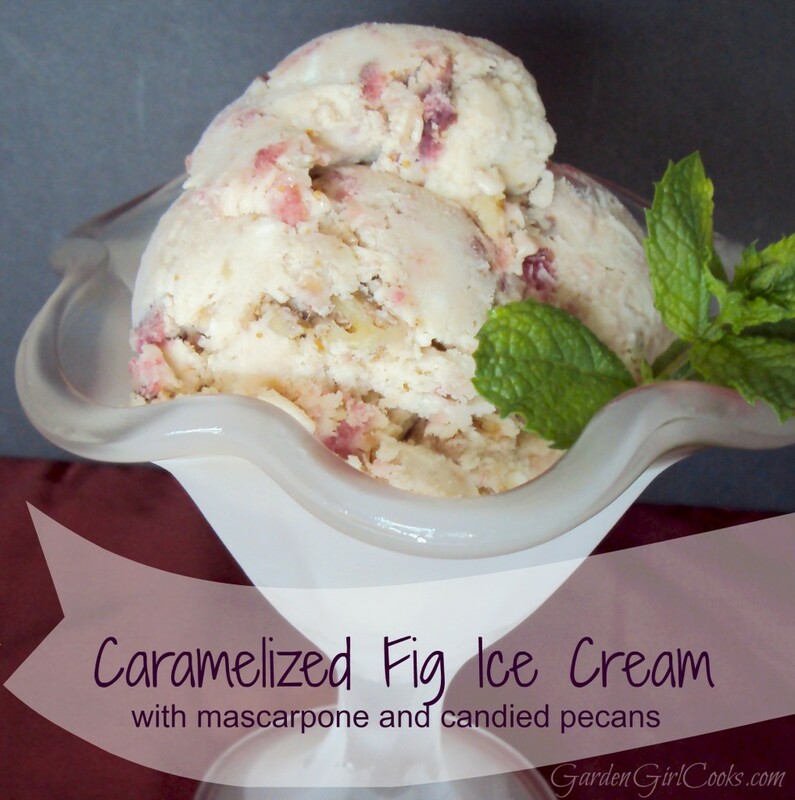 She gave me a large quantity of figs so I decided to make fig ice cream. I searched the internet and found this recipe from Happyolks. I used a different ice cream recipe and candied pecans instead of the honey roasted pecans and it was delicious. My niece agreed. I think she was a little disappointed the next time she came over and I told her that I had eaten it all. 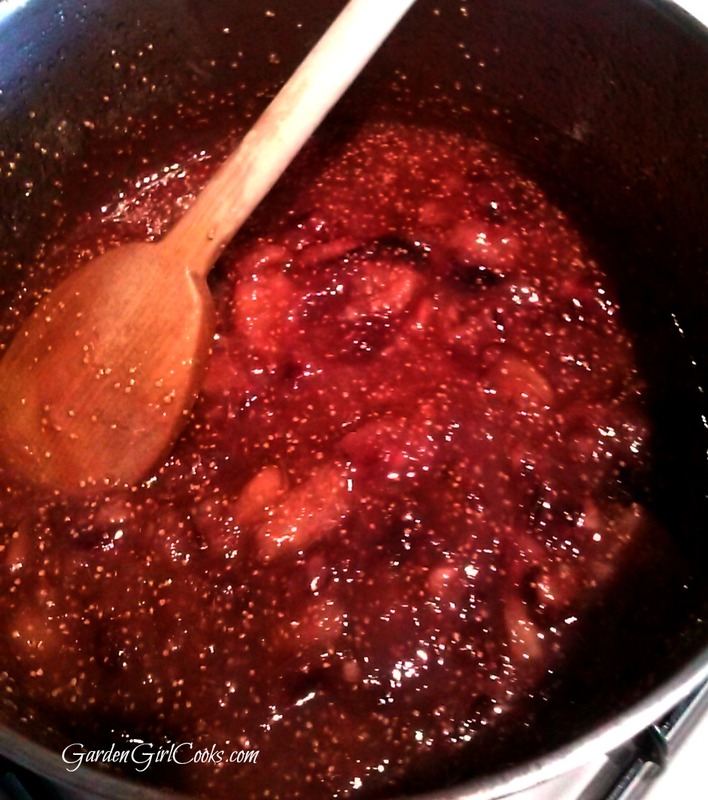 First I made the caramelized fig mixture. I could have just eaten it with a spoon, but decided I should save most of it for the ice cream. After I cooked the mixture, I let it cool and refrigerated it overnight. Next I took a 1/2 cup of the warm milk mixture and beat it into the egg mixture. Then I slowly added the egg mixture into the pan with the milk mixture. I cooked it over low heat until it thickened and the mixture coated the back of a spoon. About 7-10 mins. I poured the mixture through a mesh strainer and then stirred in vanilla extract and cooled it overnight in the refrigerator. The next day, I froze the ice cream. This is the most exciting part, because I got to finally taste the ice cream. Ice cream is not a good thing to make if you need instant gratification. It is a long project. When the ice cream was almost frozen, I poured in the fig mixture, nuts and mascarpone. I dropped little spoonfuls of mascarpone so it wouldn’t be one giant lump. I froze the ice cream for a few hours. It was worth the wait. I need to make more soon. Hopefully I can use my own figs this time! Dissolve brown sugar into melted butter. Mix in figs, lemon juice and water. Cook over medium heat breaking up the figs until it's a thick jammy consistency. Let cool and refrigerate until ready to mix into ice cream. In a sauce pan combine the milk, cream and 1/2 cup of sugar. Cook until sugar dissolves. 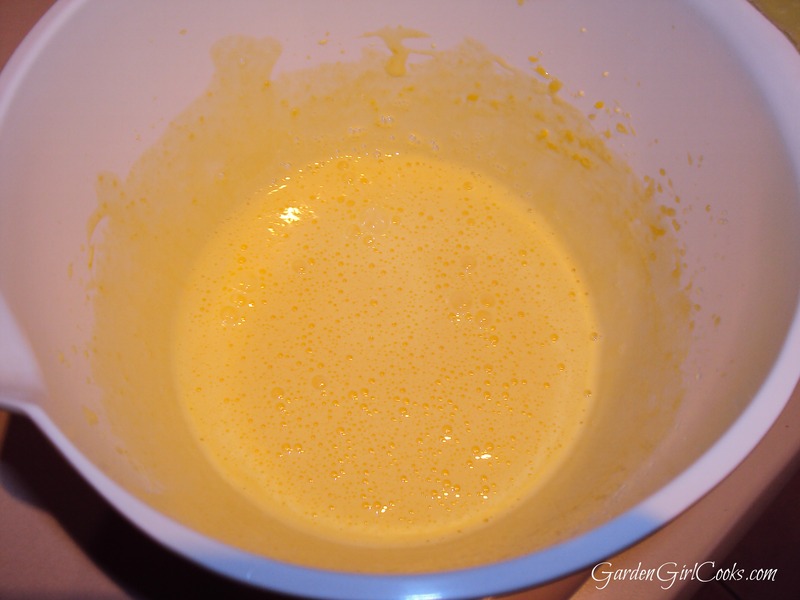 In a separate bowl beat the eggs and 1/4 cup of sugar until they become thick and pale yellow. Next take 1/2 cup of the warm milk mixture and beat it into the egg mixture. Slowly add the egg mixture into the pan with the milk mixture. Continue cooking over low heat until thick and the mixture coats the back of a spoon. About 7-10 mins. Pour mixture through mesh strainer, stir in vanilla extract and cool overnight in the refrigerator. Follow your manufacturer's instructions for freezing your ice cream. Once ice cream is almost frozen, mix in caramelized fig mixture, nuts and spoonfuls of mascarpone. Freeze at least a few hours before serving. I was craving strawberry shortcake. I usually need an excuse to make dessert, otherwise I will end up eating the whole thing. So I decided to make these cupcakes for a little get together I was having. My friends that moved away to Colorado, were going to be in town for a wedding, so we planned a little reunion party with all our old co-workers. It was really fun and great to see everyone. Strawberry shortcake is probably not the best dessert to serve to a big crowd. Who wants to assemble a large quantity of strawberry shortcakes? Not me! I thought strawberry shortcake cupcakes would be perfect, so I started my search for the perfect cupcake and frosting recipe. I came across this recipe from Damn Delicious and thought it sounded really good. I doubled the recipe and it made about 24 cupcakes in a regular size cupcake pan. I couldn’t find freeze dried strawberries for the frosting so I decided to see what other strawberry buttercream recipes I could find. I found this recipe from Add a Pinch. Instead of the strawberry syrup I used strawberry jam. I used a natural strawberry jam with no added coloring and the frosting came out a little off white, so I had to add some red food coloring. I really don’t like to use food coloring, but I didn’t want to have ugly cupcakes. I should make my own red food coloring out of beets 🙂 I will put that on my do to list! These cupcakes were a huge hit! The cupcakes were the perfect combination of cake and biscuit. It really seemed like I was eating strawberry shortcake! In my opinion, buttercream frosting is the best frosting for cupcakes. This strawberry buttercream was creamy with the just a hint of strawberry to compliment the strawberries mixed into the cake. 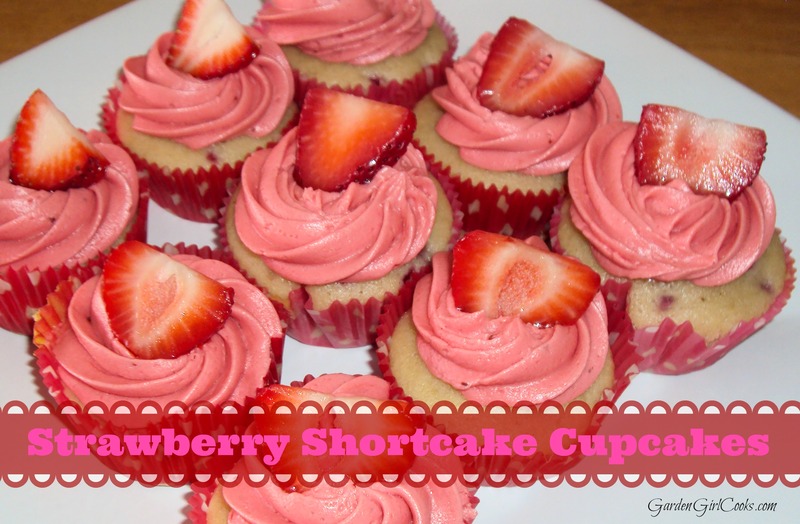 You should make these Strawberry shortcake cupcakes immediately! They have fruit in them. That makes them healthy, right? Combine flour, cornstartch, baking powder and salt. 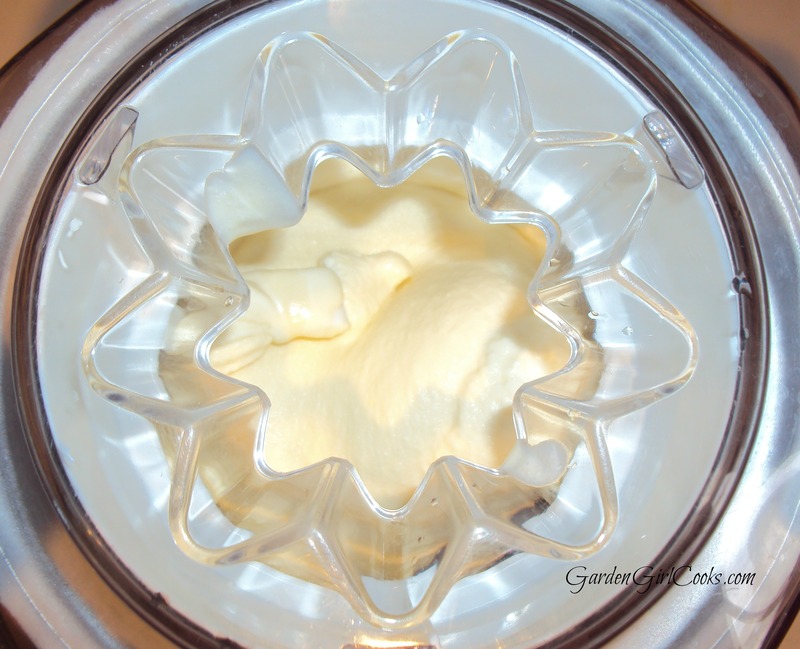 Beat sugar, eggs and vanilla on medium speed until light and fluffy, about 2 to 3 minutes. Add in vegetable oil and butter, beat until combined well. Alternate adding in dry mixture and milk. Start with a 1/3 of the dry mixture, then add 1/2 of the milk, continue until all ingredients are incorporated. You should start and end with the dry mixture. Do not over mix. Fill 24 regular cupcakes liners that have been inserted into regular sized cupcake baking tin. Fill to a little more than 3/4 full. These cupcakes don't rise a lot. Bake for 15-18 minutes until a toothpick comes out clean. Remove from oven and cool completely on a cooling rack. Cream together butter and powdered sugar, adding powdered sugar 1/2 cup at a time. Add the strawberry jam and beat until mixed in. Add half-n-half, cream or milk one tablespoon at a time until the frosting holds it's shape. Add a pinch of salt and the red food coloring. Beat slowly at first then increase speed for a final 20 seconds or until the red food coloring is mixed in and the color is consistent throughout. Refrigerate for about 30 mins until the frosting firms up. Pipe onto the cupcakes and add the strawberry slices to decorate.